This has been a summer of many defining moments on a personal level. Graduations, rare extended family vacation, a wedding, a 25th wedding anniversary, a family reunion, a move, and minor health related issues. This will surely be a summer filled with many memories. 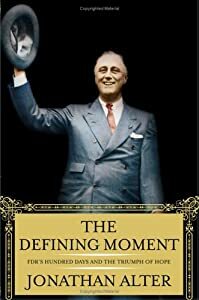 Included in my activities was a read of The Defining Moment: FDR’s Hundred Days and the Triumph of Hope by Jonathan Alter. A historical look at Franklin Delano Roosevelt’s first one hundred days in office as well as the precarious events that led to his election. In my return from a brief hiatus this summer to savor the recent defining moments in my personal life, I began to think of how this is an apt description of what has taken place this year in terms of social media and digital marketing. Will business historians in the future write about the year 2010 being the defining moment that brought on the advent of social media and digital marketing into the mainstream? Will we look back on this year as the defining moment when marketing was transformed like never before? Will several defining moments mark the point when certain companies began their decline or rise? Will we see a significant shift in our definition of the buyer persona to the digital buyer persona? There are many unanswered questions yet the answers may not be revealed for quite some time. To succeed in the emerging era of digital marketing, organizations will need to have a sixth sense ability to anticipate the defining moments that will alter the course of their existing relationships with buyers. The ability to monitor buyer engagement of social media and digital marketing tactics and strategy will need to be accompanied by an innate capability of anticipating how buyers can as well as will engage. Often, we see organization put a stake in the ground about a particular tactic or strategy with respect to social media and digital marketing. These companies allocate tremendous resources and personnel to deploy social media and digital marketing efforts. Ultimately finding that buyers are not fully embracing these efforts and finding that buyers have evolved or moved on to a different type of engagement that was not anticipated. To be sure, the rise of Twitter and Facebook can be described as defining moments in social media and digital marketing. Will these two channels have sustaining power over the long term? It is yet clear if this can be answered with a definitive yes. While some organizations have benefited from investing resources to developing each, others have seen very disappointing results. The difference makers will be those who will have the anticipatory ability to structure an approach that fits well with their buyer’s engagement behaviors. I believe that a result of this anticipatory ability on the part of several leading organizations will be the creation of new media channels that ultimately may eclipse Twitter and Facebook in the minds of buyers. A defining moment we can anticipate and be excited about indeed.